...I’ll take the Anthropocene, with no regrets. I have a quality of life unprecedented in the history of humanity and I think everyone on the planet deserves to enjoy the same privileges and opportunities I have. This means much of the world has to still modernize for billions of people to enjoy higher living standards. You can’t wave a magic wand to achieve that. It’s going to require massive economic development and massive outlays of energy that is going to stress the planet. There is no way around that. How we manage this challenge, how we meet the needs and aspirations of all of humanity while sustaining the planet’s ecology, is what the Anthropocene is all about. And I’m fine with that. Please read Kloor's Facing Up to the Anthropocene. My skepticism of President Obama and the validity of his his end-run around Congress, via the Environmental Protection Agency (EPA), is growing. When compiling pushing President Obama's carbon limits I was unconvinced the impact on greenhouse gas emissions would be greater than business as usual (BAU); one needs to think the past 8 years were particularly unusual to think the plan goes beyong BAU. In What are the Benefits and Costs of EPA’s Proposed CO2 Regulation? Harvard Professor Robert N Stavins writes that the proposed CO2 regulations probably don't make economic sense in reducing CO2 emissions*, but due to health benefits of phasing out coal they probably do. The Obama Administration’s proposed regulation to reduce CO2 emissions from the electric power sector is intended to achieve its objectives through a combination of less electricity generated (compared with a business-as-usual trajectory), greater dispatch of electricity from less CO2-intensive sources (natural gas, nuclear, and renewable sources, instead of coal), and more investment in low CO2-intensive sources. Hence, it is anticipated that less coal will be burned than in the absence of the regulation (and more use of natural gas, nuclear, and renewable sources of electricity). This means not only less CO2 being emitted into the atmosphere, but also decreased emissions of correlated local air pollutants that have direct impacts on human health, including sulfur dioxide (SO2), nitrogen oxides(NOx), particulate matter (PM), and mercury (Hg). It is well known that higher concentrations of these pollutants in the ambient air we breathe – particularly smaller particles of particulate matter (PM2.5) – have very significant human health impacts in terms of increased risk of both morbidity and mortality. The numbers dwarf the climate impacts themselves. Whereas the U.S. climate change impacts of CO2 reductions due to the proposed rule in 2030 are probably less than $3 billion per year (see above), the health impacts (co-benefits) of reduced concentrations of correlated (non-CO2) air pollutants are estimated by EPA to be some $45 billion/year (central estimate)! As with the case for setting targets for 2030 that seek to achieve, in the next 16 years, the same level of reduction seen in the past 6-8 years, these air quality figures are probably fluff. 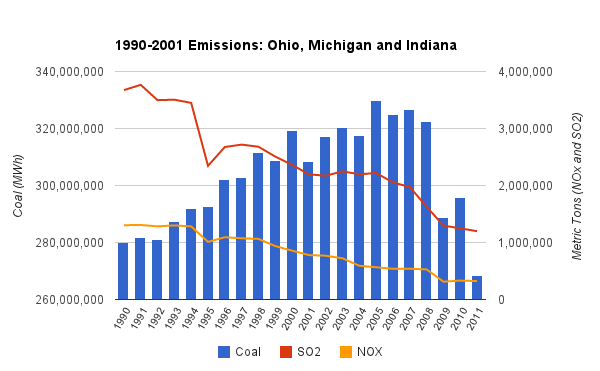 When I've looked at statistics, reductions in sulphur dioxide and nitrous oxides has been impressive in both jurisdictions that have a large share of coal-fired generation and those that utilize coal only a little. I'm not arguing pollution and CO2 won't come down - just that I don't see evidence they'll alter the trends that go back to the Bush years in office (W. on CO2, H. on SO2 and NOx). ...as climate protection is a public good, the costs of its provision must be borne at the national level alone, whereas its benefits accrue to all nations. It follows that the European Union's pioneering role in respect of climate protection can only represent a transient situation and should not be pursued further unless it is guaranteed that other major polluters will, in turn, launch comprehensive initiatives to cut emissions. This is one problem in addressing emissions.